It doesn’t really matter whether your child is a girl or a boy. When they turn three, they’re just bundles of pure energy always curious with what’s around them. It’s a good thing, too! So make sure that the toys you get can help keep that innate curiosity burning in your little girl. Give her toys that can test her imagination and allow her to play pretend, whether she’s just fake washing dishes or strolling around her fairy kingdom. Of course, you should also give her toys to develop her skills. Musical instruments, art boards, and sporty stuff can never go wrong! Review: Easy on the eyes and easy to play with! Your little girl doesn’t need to be messy to make art. She can appreciate her colors and practice her creativity with colored pegs and cards. All your daughter needs to do is to match and snap each colored peg to the same color in the card to create a picture. Then after she gets a hang of things, she can even make her own designs on the pegboard! Really, for kids that just love art with mommies that hate messes, this is a miracle toy! I swear you won’t regret buying this. Review: The great thing about block toys is that it isn’t solely for girls and boys. Your little girl can share it with her siblings and friends, and it won’t look weird. 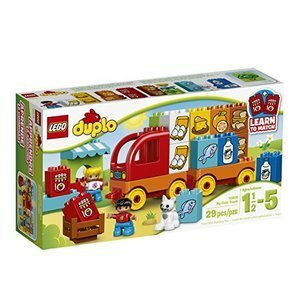 Plus, this one from LEGO DUPLO is super cute! If you’re little girl loves grocery shopping with you, she can imagine that she’s delivering the food to your local grocery. This set comes with 8 pairs of blocks decorated with different food produce. As a lover of LEGO myself, I just find this set super cute. You can even play different kinds of games with her! You can do memory games or just start building things. Review: Music is always a safe choice when it comes to gifting things to young kids. The prospect of making noise (ahem, I mean music) is just something they all love equally. Now, imagine your precious girl receiving not one but 10 different instruments at once! Words of advice, stock up on patience because it will get VERY “musical” in your house soon. 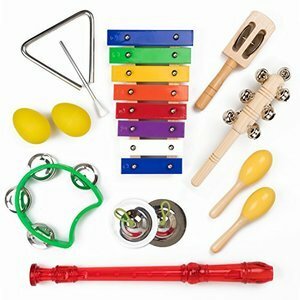 But it’s all worth it since your little girl will learn different kinds of instruments like maracas, the tambourine, and even a xylophone. She’ll be able to differentiate the sounds they make as well. You never know, this set might be the start of her true love for music. Review: Most little girls want to be a princess when they grow up, and that’s not necessarily a bad thing. Disney princesses live such exciting lives so different from ours that it’s easy to want to be like them. While you can’t make all your little girl’s royal dreams come true, giving her a princess dress-up trunk is the next best thing! 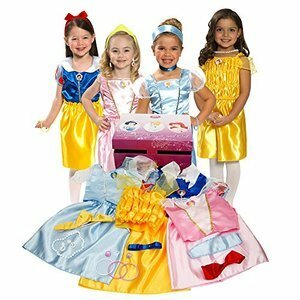 It has a whopping 21-piece wardrobe complete with shirts, skirts, a tiara, and other accessories. She’ll definitely feel princess-y every day! Honestly, I would’ve wanted this as well back in the day. 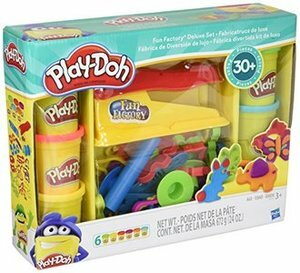 Review: The great thing about Play-Doh is that there are hardly any rules you need to follow to play with them. You can do virtually anything. Your little girl can build entire cities, create new species, or just cook pretend food. Really, anything goes! With this set, she can even make more! Not only does she get lot of different colored Play-Doh but she can also play with basic tool sets. She can cut, squish, swirl, and whatever else she feels like doing. The endless possibility for creativity is what makes Play-Doh a timeless toy. Review: In movies, everybody seems to like showing little girls playing tea party. Well, that’s probably because most little girls love to do that in real life. So why not give your own daughter a beautiful tea set of her own? 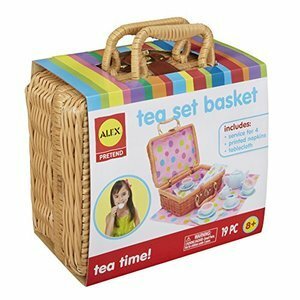 It even comes with a beautiful classic weaved basket that isn’t just for design but also functions as a storage basket for her toys. Your little girl can set up her party indoors or even go outside for a picnic. She can even invite her friends along! Review: If your daughter is an avid lover of animals, she’ll definitely want this set. 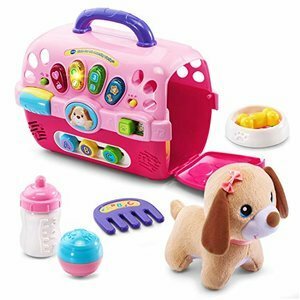 With this toy from VTech, she can pretend that she’s the kindly vet that takes care of sick animals! 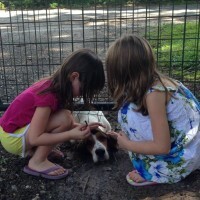 She even gets a new friend, a little puppy of her own to take care of. The pet carrier that comes with this allows her to bring her new friend wherever she goes. 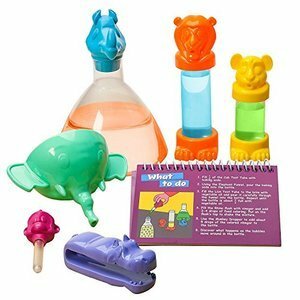 Plus, this toy set can help you teach her the importance of pet care (which is a plus if you actually have real pets in the house). Review: Do you want your little girl to appreciate the scientific side of things? 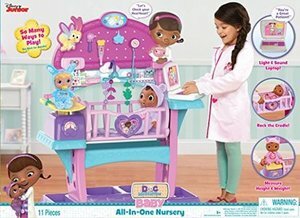 Why not give your little one her very own lab set? This comes with little test tubes, flasks, funnels, and experiment cards. 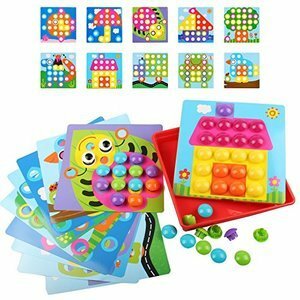 Learn new stuff in a fun way with this set since it has 10-different hands-on activities for you to choose from. It’s also a great way to bond with your daughter (because you don’t want to live her alone when experimenting, trust me). 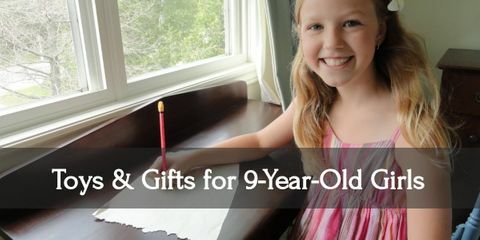 You can make slime, rainbow flowers, and even her own personal mini-lava lamp! Review: One of the most exciting games that every little kid loves playing is anything that has to do with water. Admit it, water is just fascinating! And this new dino playset is the perfect gift for your outdoor-loving little girl. It’s just any ordinary pool. Aside from the amazing design, water even flows from the palm tree and she can even have her own waterfalls! There’s a lot she can do! She can feed the little dinosaur colorful balls, and imagine that she’s on a pre-historic tour of the world. All the while, she can have all the fun in the water and under the sun! 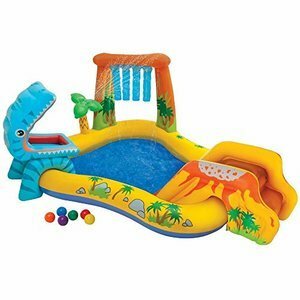 Even mommy and daddy can enjoy this play set during the sizzling weather. Review: Is your little girl a fan of Doc McStuffins? Well, she can now be her very own version of the toy doctor. With this All-in-One Nursery, your baby girl can take care of her baby dolls when they’re sick. It has lots of features she’s sure to enjoy. She can use the stethoscope to hear her doll’s heartbeat. She can use the laptop to record her diagnosis, and many more! The cradle even rocks so her baby doll can go to sleep fitfully. Her baby dolls will surely be a little spoiled with this amazing baby nursery. Your kid’s toys aren’t just made to be fun for them. They can also help create opportunities for you as a parent to bond with your kids. 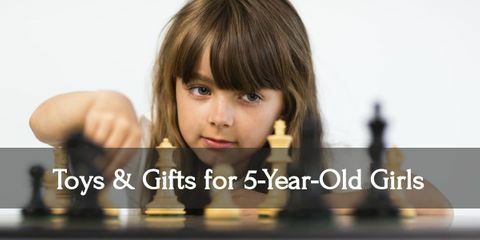 Getting toys that make your kids ask for your help or invite you to play a game with them is an overall excellent idea. So, what are you waiting for? 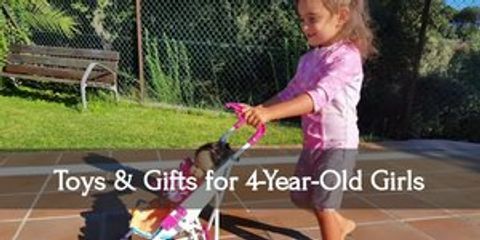 Buy the perfect little girl gift now!